out of a box of loose, unfolded clothing, “I was flabbergasted. 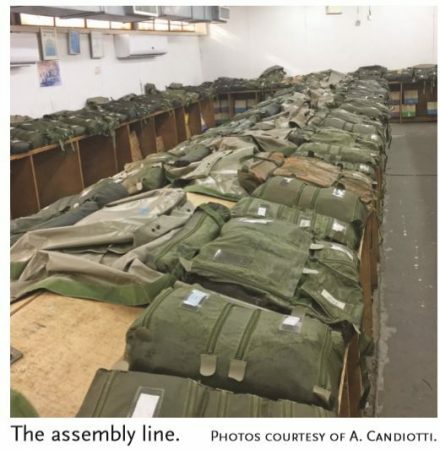 I did not think that was what they meant by ‘providing a uniform.’” Participants also had clean-up duties like regular soldiers, including mopping floors and cleaning toilets. A solemn, emotional moment of the trip was a visit with the group to the National Remembrance Hall in Jerusalem, unveiled last year. At the site, there are memorial stones for the 23,000 soldiers who have died in defence of Israel , which are lit up on their yahrzeit or anniversary of their death. “Every person’s life has meaning and no soldier dies without being remembered – forever,” she said. Arleen Candiotti with one of the medical backpacks. Photos courtesy of A. Candiotti. Reprinted with permission from the Westmount Independent.